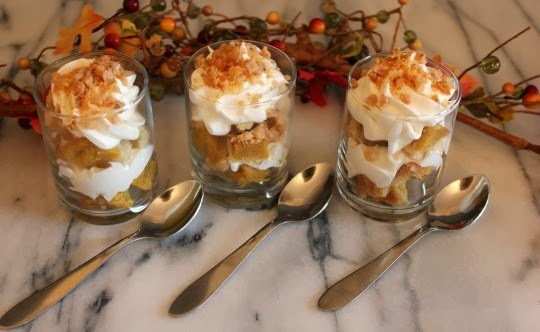 Mini pumpkin pie shooters would be perfect on a Thanksgiving dessert buffet. A pre-baked pumpkin pie makes them super easy to put together and the maple whipped cream adds just the right amount of sweetness. You could also make my cheesecake shooters or chocolate eclairs in a jar and have a variety of mini desserts to serve. Everyone would LOVE you! 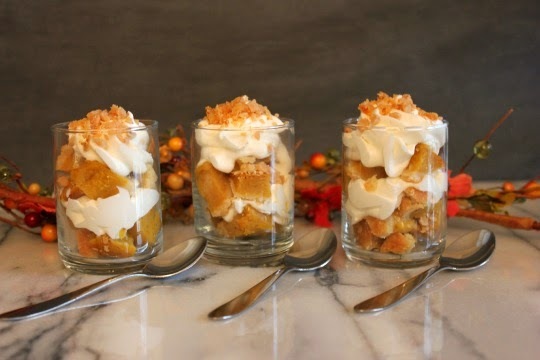 I serve the dessert shooters in small glass votive holders I find at the Dollar Store. They're just the right size for mini desserts. Layer small slivers of pie, maple whipped cream and toffee bits. Top with crushed pie crust and toffee bits. For best results, chill mixing bowl and beaters 30 minutes before making whipped cream. Beat the heavy cream on high until slightly stiff. Add the maple syrup, sugar and vanilla and whip until it forms soft peaks. Oh yes….. bring on the pumpkin everything!!! Love how simple these look to throw together for a Fall party. Pinning! I never liked pumpkin pie as a kid, but somewhere along the way I suddenly liked it. Weird. :). These look adorable! Sounds great!